At Badcock Home Furniture &more in Marion, North Carolina, we know that home is where you go to rest, eat, and retreat. It should be a place where you feel confident and comfortable. We believe everyone has the right to quality and stylish furniture, regardless of their financial situation. Make sure to ask about our in-house financing and affordable payment plans. Stop by our store at 1930 US 70 East Marion, North Carolina 28752, located just minutes from Downtown Marion. We are open Monday through Saturday 10:00 a.m.-6:00 p.m. For more information, call (828) 659-3686. 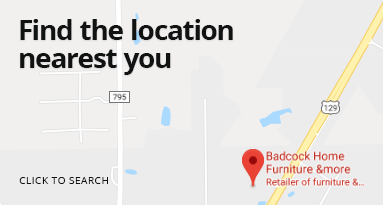 At Badcock Home Furniture &more, we’re proud to serve the community, and we’d be proud to serve you.